Rugged durability doesn’t always have to come at the expense of style. The StoreJet 25A3 offers an impressive level of anti-shock protection without sacrificing its slender good looks. 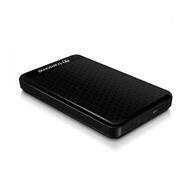 This feature-packed drive is equipped with a SuperSpeed USB 3.0 interface, a convenient auto-backup button.